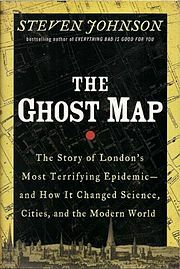 It feels strange to write “thrilling” and “cholera” in the same sentence, but “The Ghost Map” by science writer Steven Johnson is a thrilling historical account of a horrible cholera outbreak in Victorian London. The reader who nominated this title for One Read calls it a “fascinating” story about the early detection of communicable disease. At the center of this tale is Dr. John Snow who revolutionized the way we think about disease, cities, science and the modern world. This work of nonfiction moves quickly, with the central characters working to solve this public health puzzle. The blending of history, science and medicine make this an engaging read. See what other books your fellow readers have suggested for One Read 2014!